Drying is the oldest method of preserving food. Throughout history, the sun, the wind and a smoky fire were used to remove water from fruits, meats, grains and herbs. By definition, food dehydration is the process of removing water from food by circulating hot air through it, which prohibits the growth of enzymes and bacteria. Dried foods are tasty, nutritious, lightweight, easy to prepare and easy to store and use. The energy input is less than what is needed to freeze or can, and the storage space is minimal compared with that needed for canning jars and freezer containers. The nutritional value of food is only minimally affected by drying. Vitamin A is retained during drying; however, because vitamin A is light sensitive, food containing it should be stored in dark places. Yellow and dark green vegetables such as peppers, carrots, winter squash and sweet potatoes have high vitamin A content. Vitamin C is destroyed by exposure to heat, although pretreating foods with lemon, orange or pineapple juice increases vitamin C content. Dried fruits and vegetables are high in fiber and carbohydrates and low in fat, making them healthy food choices. Dried fruit has a higher concentration of carbohydrate than fresh fruit; therefore, serving sizes tend to be smaller. According to MyPlate and the USDA's Dietary Guidelines for Americans, ½ cup of dried fruit is equivalent to 1 cup of fresh fruit. Diabetic individuals must especially take into consideration smaller serving sizes when planning meals and snacks to avoid elevated blood glucose levels. 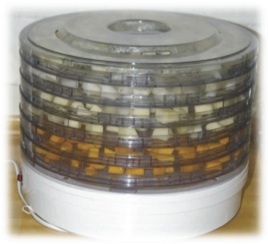 To be certain of the final quality and consistent drying of foods, a dehydrator is recommended, especially with unpredictable Ohio weather. Sharp knives and a food processor or blender will also make the drying task easier. Many guidelines call for blanching, steaming or pretreating foods. Equipment for these processes includes a deep kettle with a lid and a wire basket, a colander, or an open mesh cloth bag to hold produce. A nonmetal bowl is best for pretreating fruits and vegetables to prevent discoloring. Select ripe fruit for drying. For best results, use fresh produce, free from blemish and mold. Even slicing of food allows the dry air to circulate and dry the surface area of the food first. Cut foods into ⅛-inch to ½-inch slices. The higher the water content, the larger you should make the slice size. Small slices of high-moisture foods such as watermelon would disappear when all the moisture has evaporated. Peel fruits and vegetables, including bananas, melons, winter squash, and other fruits and vegetables. Some foods such as apples or tomatoes may be dried with the peel on, but realize that unpeeled fruit takes longer to dry. Whole fruits and vegetables can be dried, but time and attention will be required for a successful product. Before drying, place them in boiling water and then in cold water to crack the skin. This process is referred to as "checking" the product and will hasten the drying process. Pretreatments are recommended techniques used to make quality products. Pretreatments not only prevent darkening and improve quality; they also cause the destruction of pathogens that could cause foodborne illness—such as Escherichia coli O157:H7, Salmonella species and Listeria monocytogenes. Pretreatments include dipping, blanching, cooking or candying. Dipping prevents oxidation or color changes in fruits and vegetables. Dipping fruits in ascorbic acid (vitamin C) is one of the safest ways to prevent fruit from turning brown, but its effects may not last as long as sulfuring. Ascorbic acid can be purchased from drug or grocery stores, in powder or tablet form. One teaspoon is equal to 3,000 milligrams in tablet form. Mix 1 teaspoon in 2 cups of water. Allow the fruit to soak for 3–5 minutes, then drain well and place on dryer trays. After two "dips" with produce, add more acid to continue the effectiveness. Commercial fresh fruit stabilizers or mixtures can also be used, but they might not be as effective and most are more costly. Dilute 1½ tablespoons of stabilizer in 1 quart water. Again, soak for 3–5 minutes, then drain and place on dryer trays. Refresh the solution after two times of soaking produce. Fruit juices can also be used. Dip fruits in pineapple or orange juice or other high vitamin C fruit. Remember each fruit will also lend its flavor as fruits soak for 3–5 minutes. Drain well and place on dryer trays. Use twice before placing, and the juice is still safe to use in other drinks or recipes. Sodium sulfite is another commercial product for pretreating foods. Sodium metabisulfite is available at many wine supply shops or some pharmacies. Stir 1 tablespoon of sodium metabisulfite into 1 quart of cold water. Allow fruit to soak 10–15 minutes, then drain and place on dryer trays. This solution is only good for one dip; remake for more than one use. Steam blanching can be used, but the flavor and texture of the fruit might change. This process is the same as for vegetables. Bring water to a boil. Place produce in a basket not over 2 inches deep, over the boiling water. Cover tightly with a lid and blanch according to Table 1. Generally speaking, vegetables are great to dry because they contain less acid than fruits and can be dried until they are brittle. When properly dried, vegetables contain only 10 percent moisture, and no known microorganisms can grow at that level. Wash, peel and trim produce; then, cut into pieces for drying (could be slices, sticks, cubes or shredded), taking care to remove any tough or "woody" part of the item. Even pieces are one secret to successful drying, as all will dry at the same rate. Only prepare what can be dried at one time. Blanching is recommended for vegetables, as it stops the enzyme action that controls the color and flavor during storage. It also helps to decrease the drying time and cooking time at the other end because the tissue walls of the produce have been relaxed and moisture can escape and re-enter more easily. Boiling water blanching or steam blanching are both effective, but steam blanching is more time consuming. Water blanch vegetables by submerging them in a wire basket into a pot of boiling water for the designated time (see Table 1). Steam blanch vegetables as above, but do not submerge; the water should not come into contact with the product. Cover and steam according to Table 1. Only steam blanch small amounts at a time. After blanching, cool quickly in an ice water bath; then, drain and place in a single layer on the drying tray. It's OK if the vegetables are still warm; that will hasten the drying process. As with fruits, pay attention to the end of the drying time so the product does not scorch. 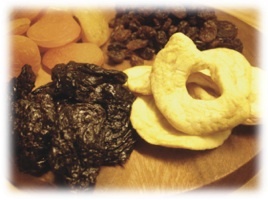 Dried fruits are generally done when they reach about 20 percent moisture content. Because fruit will be more pliable when warm, cool several pieces and test by folding the fruit upon itself; it should not stick together. Berries should rattle when stored in a container. When drying is complete, cool the fruit before storing, but don't leave out to gather additional moisture from the air. The product is then ready to be conditioned. Dried vegetables should be crisp when dried and should "snap" when broken in two. At this stage of moisture, no conditioning is needed. If food was dried outdoors, which is not recommended in the Ohio climate, there could be eggs on the food from insects that touched the food during drying. To pasteurize and kill the eggs post-drying, either place food in a freezer bag and freeze for 48 hours or heat the dried food at 150°F for 30 minutes or 175°F for 15 minutes. Be careful not to scorch the food. After drying or pasteurizing, conditioning of dried foods is the last step before final storage. For fruit, place the cooled product in a tightly sealed glass jar, shaking daily for 7–10 days. If condensation develops, return to the dehydrator for more drying. Package dried food for long-term storage after conditioning for 10 days. Remember to keep food with high vitamin A or C out of direct sunlight during storage. Select ripe or slightly overripe fruit. Wash fresh fruit or berries in cool water. Remove peel, seeds and stem. Cut fruit into chunks. Use 2 cups of fruit for each 13-inch by 15-inch fruit leather. Puree fruit until smooth. To prevent darkening, add 2 teaspoons of lemon juice or ⅛ teaspoon ascorbic acid (375 milligrams) for each 2 cups of light-colored fruit. If you choose to sweeten the leather, add corn syrup, honey or sugar. Corn syrup or honey is best for longer storage because they do not crystallize. Sugar is fine for immediate use or short-time storage. Use ¼ to ½ cup sugar, corn syrup or honey for each 2 cups of fruit. Saccharin-based sweeteners could also be used to reduce tartness without adding calories. Aspartame sweeteners might lose sweetness during drying. Home-preserved or store-bought canned or frozen fruit may also be used to make leathers. Drain fruit and save liquid. Use 1 pint of fruit for each 13-inch by 15-inch leather. Puree fruit until smooth; if too thick, add liquid. Add 2 teaspoons of lemon juice or ⅛ teaspoon ascorbic acid (375 milligrams) for each 2 cups of light-colored fruit to prevent darkening. Applesauce can be dried alone or added to any fresh fruit puree as an extender. It decreases tartness and makes the leather smoother and more pliable. For drying in the oven, a 13-inch by 15-inch cookie pan with edges works well. Line pan with plastic wrap, being careful to smooth out wrinkles. Do not use waxed paper or aluminum foil. To dry in a dehydrator, purchase specially designed plastic sheets or line plastic trays with plastic wrap. Items placed on the trays should not touch; allow space between items for air flow. Remember to watch food more closely at the end of drying times, as the decline in moisture causes food to dry faster and may scorch. Fruit leathers can be poured into a single large sheet (13-inch by 15-inch) or into several smaller size pieces. Spread purée evenly, about ⅛-inch thick, onto drying tray. Avoid pouring purée too close to the edge of the cookie sheet. Larger fruit leathers take longer to dry. Approximate drying times are 6 to 8 hours in a dehydrator or up to 18 hours in an oven. Dry fruit leathers at 140°F. Leather dries from the outside edge toward the center. Test for dryness by touching center of leather; no indention should be evident. While warm, peel leather from plastic and roll. Then, allow the leather to cool and rewrap the roll in plastic. Chances are, the fruit leather won't last long enough for storage. If it does, it will keep up to 1 month at room temperature. For storage up to 1 year, place tightly wrapped rolls in the freezer. Andress, E., and J. Harrison. So Easy to Preserve. 6th ed. Athens: University of Georgia Cooperative Extension Service, 2014. USDA. "Fruits: Nutrients and Health Benefits." Accessed on August 5, 2014. choosemyplate.gov/food-groups/fruits-why.html. Apples Pare, core and cut into ⅛-inch slices or rings. Pretreat dipping for 2 minutes. Pliable, springy feel, creamy white. No moist area when cut. Bananas Peel, cut into ¼-inch slices. Dip in ½ cup pineapple juice mixed with ¼ cup honey. Sticky, chewy, caramel-like color. Berries Leave whole, except slice strawberries in half. No visible moisture when crushed. Cherries (any kind) Remove stems and pits. If juicy, drain 1 hour. Leathery but sticky. Grapes Leave whole, remove stems. Dip in boiling water to crack skins. Pliable, dark brown. Peaches and apricots Peel if desired, remove pits, slice. Pretreat dipping solution. Pliable and leathery. Pears Pare and remove core and woody tissue. Cut into ¼-inch slices or rings, or into quarters or eighths. Pretreat dipping solution. Leathery, springy feel. Pineapple Peel, core and slice ½-inch thick. Pliable, spongy to the touch. Plums Same as prunes. Use freestone varieties. Pretreat. Pliable and leathery. Prunes Cut in halves and remove pits or leave whole. Halves: No pretreatment. Whole: To soften and crack skins and to help fruit dry better, hold in steam or boiling water for 2 minutes. Pliable and leathery. Beans, green and lima Shell. Steam 15–20 minutes, or until tender but firm. Shatters when hit. Beans, snap Trim and slice lengthwise (or cut in 1-inch pieces). Steam about 3–5 minutes, or until tender but firm. Spread about ½-inch deep on trays. Brittle, dark green to brownish. Beets Trim off all but 1 inch of tops and roots. Steam whole about 30–60 minutes, depending on size, or until cooked through. Cool and peel. Cut in ¼-inch cubes, or slice ⅛-inch thick. Spread not more than ¼-inch deep on trays. Brittle, dark red. Broccoli Trim, slice lengthwise in ½-inch strips. Steam 10 minutes or until tender but firm. Brittle, very dark green. Cabbage Trim, cut into ⅛-inch thick strips. Steam 5–10 minutes, or until tender but firm. Spread evenly to a depth of not more than 1 inch. Pretreat with lemon juice. Crisp, pale yellow to green. Carrots Scrape or peel. Slice crosswise ⅛-inch thick, or dice in ¼-inch cubes. Steam small pieces 3 minutes (or shred before steaming). Spread in thin layer on trays. Very brittle, deep orange. Celery Remove leaves, cut stalks into ½-inch pieces. Water blanch 1 to 2 minutes or until tender. Stir occasionally during drying. Very brittle. Corn Husk and trim. Blanch whole ears 9 minutes. For medium or raw kernels, blanch 3–5 minutes. Cut corn from cob after blanching. Shatters when hit. Eggplant Peel and slice ⅛- to ¼-inch thick. Dip in lemon juice solution for 5 minutes or steam 5 minutes (or until tender). Leathery to brittle. Greens Trim off tough stems. Steam 5 minutes or until tender. Spread leaves that mat, such as spinach, about ¼-inch deep. Crisp, very dark green. Mushrooms Peel the larger mushrooms. Dry whole or slice, depending on size. No precooking necessary. If stems are tender, slice for drying; if tough, discard. Spread on trays. Leathery to brittle. Onions Peel, slice into ⅛-inch rings. Blanch 1 minute. If dried for seasoning, do not steam. Very crisp. Peas, green Steam shelled peas 3 minutes or until tender. Stir during drying. Shatter when hit with a hammer. Peppers (all kinds) and pimentos Cut into ½-inch strips or rings. Remove seeds. Steam 10 minutes. Spread rings 2 layers deep; spread strips not more than ½-inch deep. Pliable. Pumpkin and winter squash Quarter, remove seeds and pit, cut in 1-inch strips and peel. Slice strips crosswise ¼-inch thick. Bake at 300°F until soft. Place in dehydrator. Leathery. Soybeans, edible green Blanch pods in steam 10–15 minutes, or until beans are tender but firm. Shell. Shatter when hit. Squash, summer and zucchini Trim, slice ¼-inch thick without peeling and steam 6 minutes or until just tender. Pretreat optional. Leathery to brittle, yellow. Tomatoes (meaty varieties only) Dip in boiling water for 1 minute. Peel, remove stem end and slice ⅛-inch thick. Leathery, dull red.